Around 200 flavour compounds have been identified in malt whisky, many of which have a clear role, such as esters providing fruitiness, while others remain unidentified, and their role consequently uncertain. The level of various flavour compounds is measured in terms of parts per million (ppm), with 1 ppm equivalent to one milligram in a litre of malt whisky. However, flavour compounds are also measured in terms of parts per billion, and parts per trillion, with even this level able to have an influence. “We understand a lot about the science of production, but understand least how flavours deliver and interact. Flavour is also very subjective, and what’s in the glass is one thing, but how it’s perceived is another, as some people can detect flavours that others can’t, so it’s difficult to say too many things definitively,” says Bill Lumsden, director of distilling, whisky creation & whisky stocks, Glenmorangie. The first phase of flavour creation is producing new-make spirit, with fermentation and distillation the key stages. “The flavour profile of the new-make spirit, which we refer to as the distillery character, accounts for around 40 per cent of the flavour of a bottled whisky. The classic notes of The Balvenie, the inherent sweetness and honey note are already there in the new-make spirit, together with a biscuity, cereal character, which are augmented and elevated during maturation,” says Brian Kinsman, master blender, William Grant & Sons. While ageing, the spirit gains flavours from the cask (usually Bourbon or sherry casks), while also evolving through evaporation and oxidation. Oxidation is the process of air entering and exiting the cask (oak being porous). Oxygen is the crucial element, dissolving in the spirit and instigating various reactions that can promote greater fragrance, fruitiness and complexity. Evaporation from the cask accounts for around 2 per cent of the volume of liquid annually, and the decreasing volume of spirit sees a certain ‘concentration‘ of flavours. Evaporation and oxidation also help lower the level of sulphur compounds. Essentially formed during fermentation, these include vegetal, meaty, rubbery notes. Although their presence is measured in parts per billion and even trillion, they are assertive enough to ‘mask’ lighter characteristics. Consequently, lowering the level of sulphur compounds enables lighter notes such as fruitiness, vanilla, and sweetness to show more clearly, which significantly changes the flavour profile. Vanilla is a key flavour, with small amounts evident in new-make spirit (derived from barley), though the key contributor is the cask. But vanilla also has a significant interaction with other flavours, making fruit notes, for example, seem richer and rounder. Fruit notes are provided by esters which are primarily created during fermentation, when complex interactions between alcohol and acid molecules (in the liquid being fermented) sees them integrating and transforming into various ester types. “Esters contribute a range of fresh and dried fruit flavours, from really sharp citrus notes to luscious berry sweetness. And I don’t think we have yet identified all the esters present in malt whisky,” says Brian Kinsman. Sweetness and dryness may not be considered flavours as such, but they play an important role. “Sweetness makes fruit seem ripe and luscious, but you need to balance that with dryness, which adds range and complexity. Dryness also underlines certain notes, such as phenolic compounds in a peated malt,” adds Bill Lumsden. Dryness is often attributed to tannins, which are derived from the cask, with tannins also (typically) credited for adding structure and body. However, quantifying the extent to which these attributes are justified is hardly easy. “Tannins definitely drive structure and body, with a silky mouthfeel, but it’s undoubtedly a range of compounds including esters that come together to deliver this,” says Brian Kinsman. And that’s the key – how the range, and levels, of flavours interact. “A malt’s flavour profile is not simply a numbers game, according to the level of each flavour compound, it’s a complex balance of flavours, some of which have miniscule levels but a huge sensory impact. Additionally, flavours can behave differently, for example, citrus notes are of a similar intensity on the nose and palate, whereas peaty notes tend to be significantly amplified on the tongue. 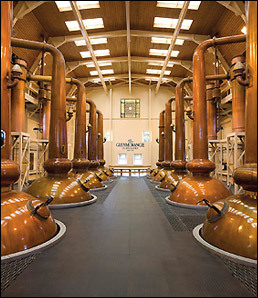 All this makes whisky flavour a fascinating subject,” says Rachel Barrie, Scotch whisky master blender, Beam Suntory. Bourbon barrels contribute vanilla, honey, fruit and spices, with a light, dry sweetness. Sherry casks add richer sweetness with vanilla and dried fruit notes including raisins and prunes. This difference is principally due to Bourbon barrels being American oak (quercus alba), with sherry casks usually, though not always, European oak (quercus robur). When Bourbon barrels are constructed, a flame is applied to briefly ignite the interior (then extinguished with water). This creates a surface layer of char, around 2mm deep, with the heat also toasting an underlying 2 – 3mm layer of oak. A flame also toasts (but doesn’t ignite) the interior of sherry casks, creating a 2 – 3mm toasted layer. Toasting breaks the oak down into various flavour compounds. During the Scottish summer, as the ambient temperature rises, spirit in the cask expands (readily penetrating the char in a Bourbon barrel) and enters the toasted layer. In winter, as the temperature cools, the spirit contracts and exits the toasted layer, carrying flavour compounds back into the ‘bulk’ of the spirit.